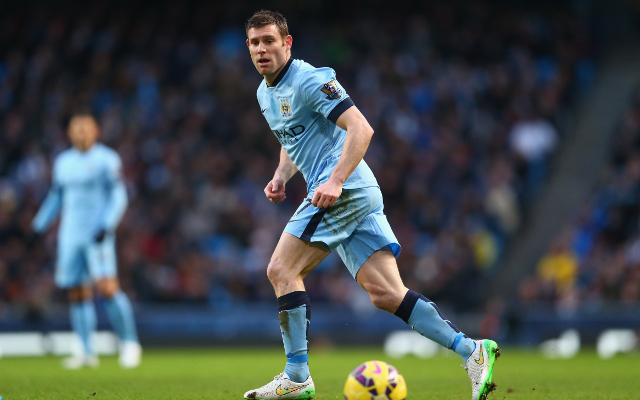 Arsenal are reportedly preparing a deal to lure Manchester City midfielder James Milner to the club in the summer. The England international has been heavily linked with a move to Premier League rivals Liverpool when his contract runs out at the end of the season however Arsenal have now joined the race for the 29-year-old. Sky Sports commentator Alan Smith reportedly said he heard the England international will sign for the Gunners during the summer while covering Arsenal’s 1-0 loss to Swansea on Monday. Alan Smith has just said live on Sky that he's heard James Milner is off to Arsenal this summer on a free transfer. Milner has made just 16 starts for City this season and is believed to be in the search for more first-team action next term. Arsene Wenger is keen to add depth to his squad as the Gunners prepare to launch an assault on the Premier League title in 2015/16, and the versatile Milner would be an excellent addition to the north London outfit. Wenger will face stiff competition for the former Aston Villa and Newcastle man’s signature, with Liverpool boss Brendan Rodgers keen to bring Milner to Anfield.